Exclusive – Social Q&A site Sharecare.com, created by WebMD founder Jeff Arnold and TV’s Dr. Mehmet Oz, is partnering with Healthline Networks, a provider of intelligent health information services. Healthline currently powers the health platforms at Yahoo Health, AARP, Aetna, United Health Group and others. Going forward, it will power Sharecare’s search services too. One of the more interesting products resulting from the partnership is the integration of Healthline’s 3D BodyMaps, a visual search offering that lets users browse the human body to see how diseases and other medical conditions can affect it. The launch is timely, given Google’s recent announcement that it would shut down its own Google Body Browser project, which will be closed and the code open-sourced. In case you’re unfamiliar with Sharecare, the site is a social counterpart to the older WebMD, both of which were founded (or co-founded) by Jeff Arnold. It’s probably what WebMD would be, if launched today. Instead of simply serving up informational pages containing health information like WebMD does, Sharecare users can ask questions using the site’s search interface to get connected to a network of some 3,000 medical professionals. 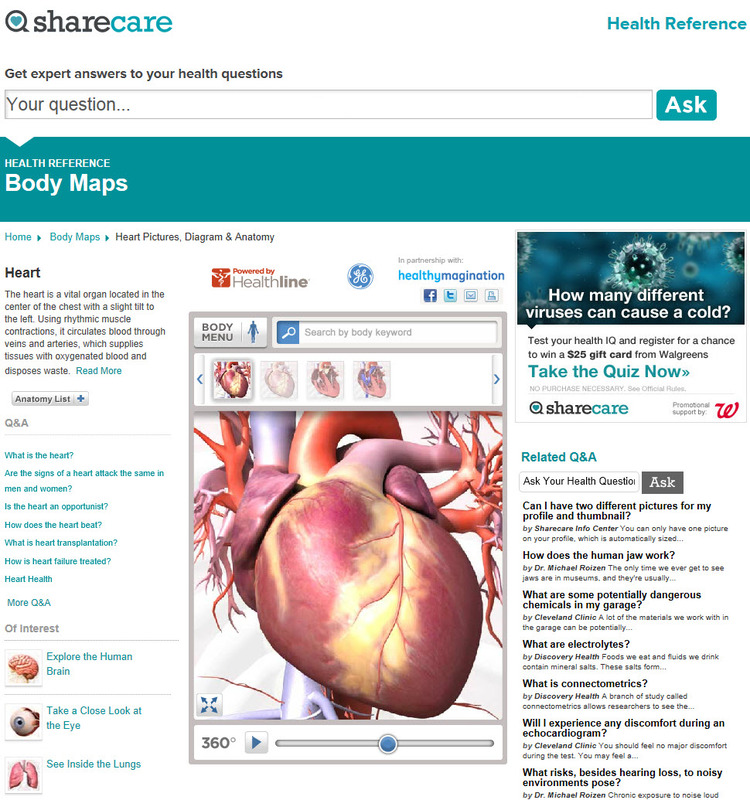 The doctors on the site (including Dr. Oz) aren’t providing diagnoses, of course, but they do answer more fact-based health related questions, like “what does collagen do?” or “how does laser teeth whitening work?” There are also online communities where users can track topics and interests of their own, and connect with others. Healthline Networks has raised $50 million in funding, mainly from strategic investors including Aetna, GE/NBC Peacock Fund, Investor Growth Capital, Kaiser Permanente, Reed Elsevier, U.S. News & World Report and VantagePoint Venture Partners. Sharecare, meanwhile, is partnered with Oprah’s Harpo Studios, as well as HSW International, Sony Pictures Television and Discovery Communications. The site benefits from on-air mentions made during the Doctor Oz TV show, which are expected to increase with the new product rollout.